Overall performance is very good at BiS. You can melt anything down so damn fast. Anyway I'm not going to hype it. I hope you'll try or adapt from me and see it yourself. Health gain method is relying on ADCtH and some instant heal. I like being ranged for long time. 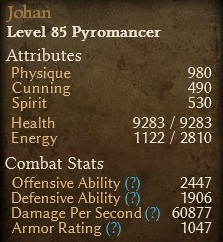 So I think it's time to show my pyromancer build. It is ordinary like other DW gunslinger. But I don't see full guide for long time. Also there're some threads about DW gunslinger recently. I think this may help them figure out how full build will be like. The concept is to combine Infernal Knight set and DW pistols. The whole set and the pistols seems to match each other. The only problem is lack of some resistance. It's shame for me to use so many MIs in the guide for the sake of BiS. I'll make it the most flexible as I could. It's necessary to get all specs I need. Because Ranged isn't get enough love from devs. I need to sacrifice some to grab more power. So I need to use really good affixes for good at all resistance. I'll talk about only Greens. Because getting specific affixes is harder than purple. Boots : Any affixes for the resistance you're lacking for the rest, Considering to be the last gear you may find. Or you may use any legendary you like. Mine is anything I have left in this char after few crafted. You'll see it's not outstanding affix. Blast Shield : Very good defensive proc. It's like you get extra huge shield for 4 secs. Firestrike : Our main attack. Max Firestrike and Brimstone due to the most powerful in the line. Only 1 in Static strike. And 12/12 for most efficient in Explosive Strike. BWC : By a lot of bonus. It's 12/12 easily. Very effective radius and transmute help in reduced enemy physical dmg. 12/12 Agonizing Flame for full 25 unstackable flat overall RR. Flashbang : Best CC against boss and mobs. I spend it only most efficient points. Vindictive Flame : 11/16 for the most efficient in total speed. Solael's Witchfire : max all for the sake of auto-attack based build. CoF : 4/10 for more radius. 10/10 Vulnerability for stackable -30% elemental and vitality resistance. This will amp. our dmg more and more. Blood of Dreeg : Due to this is offensive build. I spend 8/16 for exact 20% health boost and 1 point of wonder in Aspect of the Guardian for extra small physical resistance. Chariot of the Dead for instant health and add high DA. And the nodes are helpful for OA too. Very versatile constellation. Solael's Witchblade, Ulzuin's Torch, Magi, Fiend and Abomination for Offensive purpose. Procs from Fiend is incredibly good. For AoE around self or single dps with %weapon dmg. You get some ADCtH too. Ghoulish Hunger for ADCtH because our build is rely on attack and weapon dmg so much. And the procs can turn the tide of battle very good. I consider Fabius and Iron Maiden to be the hardest trial in main campaign for ranged and caster builds. 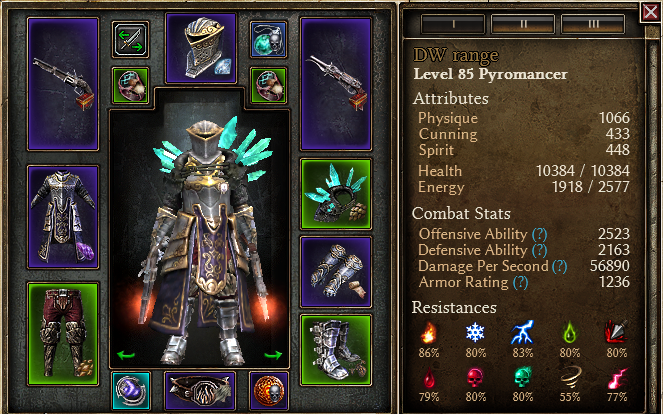 But my pyromancer is with Kymon's. So I can only test with Fabius. - Fabius : Try to kite in circle shape for avoiding his shadowstrike when first approach. When he appear, dodge his bladespirit and setup fight with Thermites, BWC, Flashbang and CoF Then autoattack button. Be careful when he use blade barrier because you'll get reflect so hard as you hit him. Keep the debuff on him then finish him off not too long. Other than this is his WPS like execution could drop your health bar low(attack with both hands at once). - Moosiluake : Due to the build don't have freeze resistance. If you feel kite and destroy his ice totem is annoying. Use frosthoar ointment. 1. Basic method. You can either play Crucible DLC to get some lv and devotion before playing normal or veteran. 2. A single mastery is enough to clear veteran or normal. Play any skills you like. Demolitionist is newbie friendly and don't need to know very much in deep mechanic. It is just throwing your skills then dodge any incoming dmg. Simple and easy. You can start with any of them. 4. Go to Ultimate. Not different much for caster or range. You just do the same. Run N' Gun. Last edited by InkOsk132; 07-11-2017 at 12:26 PM. im not a fan of the Fiend devotion for this build. flame torrent is more for melee builds, but i guess if you dont kite much, it works totally fine for you . your build is a lot more chaos focussed, so i see why you put more points in a few things like second rite. i still think you could cap blood of dreeg for its heal and OA, maybe even cap vindictive flame for more attack speed, but thats preference and i get your reasoning. I'm not sure about dmg curve in raising atk speed beyond 3.00 per sec or 150%+ . Wanna know efficient compared to OA and crit dmg. Anyway thanks for remind me about this set up. I felt the same, but anyway there's no other better way for fighting in long or medium range and Fiend is too good. I end up not to kite often and can facetank for a while. I tried pet's buff too. But it has low %dmg bonus for each lv. It's ordinary 7-8% per lv which I had only +2 all occultist. So I don't take it. Wanna know efficient compared to OA and crit dmg. 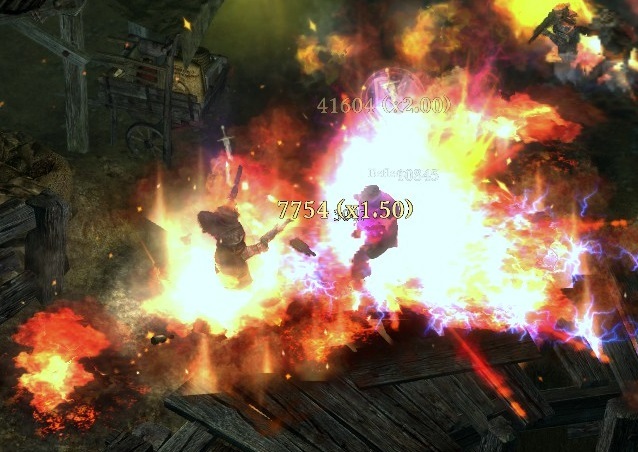 Empowered Essence+Dread Skull give you not only attack speed but also flat fire. You lost 2% chance to crit and 15% crit damage, but still get like 5% damage output increase cause of higher dps. Not sure I'm right, but this is my opinion before someone prove me otherwise. Have you tried using fiend on mine and abomination on FS for 100% uptime? I guess it does not make a huge difference if you facetank a lot. Why not switch Fiend with Bat? Some ACTH , usefull sustain proc? Nice build =) Thanks for it!